Request: I'm looking for any photograph of the original Barbican production as well as the Skydome, Toronto 1989 and Windsor Castle 2004 concerts. Also any depicting the death of Enjolras would be much appreciated. Please contact me via pm or post them here. Thanks in advance mes amis! I have a few ultra rare stills of the original London production including an awesome pic of Patti LuPone as Fantine on stage. It's a nice change from the one IDAD picture that is available of her in the role. I also have shots of the students at the barricade and you could see just how massive the original production was at the Barbican/Palace. All of these are in color, of course. The only thing that makes me not post them is, the site I got them from had a stern warning about posting without permission. Even if it didn't, it'd be real bad form to just post away like that. Only problem is, I can't seem to remember the URL so you guys could just go there and see them for yourselves. Maybe one of you knows which site I'm talking about? If you do, post the link for me? If nobody knows, don't sweat it. I have the details stored away on some piece of paper, lost in this vast junkyard also known as my office. It's gotta be somewhere in here, I can assure you of that! LOL. Also, I've since expanded my souvenir brochure collection by a dozen, or so. Including one from early on in the Palace Theatre run, the OBC brochure, first New Zealand engagement of the Aussie tour in '91, and a few others. I'm a lazy mofo, so who knows when those will get scanned but I'll share away those ultra rare shots as soon as I locate the URL!!! The 1981 show is the mother of them all Miserables productions ! Scott Irwin, 10th Anni Australia Tour 1997. 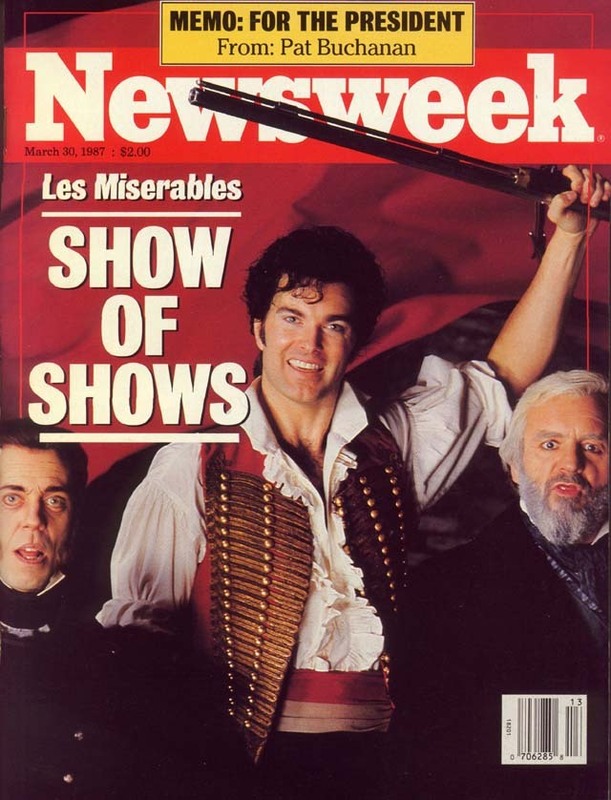 Heck of an Enjolras, should rank among the best. 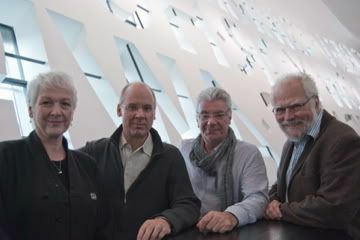 From Left: Kate; Caird; Napier; and Hersey, 2011. I actually have either a scan or a photocopy of that Newsweek issue. I'll try to find it. The whole 1980 production brochure, with photos, cast, orchestra, songs and synopsis...I love this internet!! Hossein was really into chains for every scene and every actor. I can't get over how the original French production had a very similar look to the version we all know. And that orchestra! !